Part of a campaign by some organisations to use whatever strategies are necessary to build dams anywhere in the world, especially in developing countries. By Chris Lang. Presentation at the meeting, “Dammed at Home, Damming Abroad”, European NGO-hearing on dams, Bratislava, Slovakia, 16-19 January 2000. Also submitted to the World Commission on Dams. What I’ll look at in this presentation is part of the campaign by some organisations to use whatever strategies are necessary to PROMOTE the construction of dams anywhere in the world, especially in developing countries. Behind decisions on whether or not to build dams is a web of actors, sometimes actively working together to promote dams, sometimes working informally. Together they help to support dam-building companies, who are after all the ultimate beneficiaries of dam building through the lucrative contracts they receive to investigate, study, advise on, design and build dams. As the next World Commission on Dams hearing will be in Vietnam it seems to me appropriate to start there, and talk a little about what is currently happening in the hydropower scene in Vietnam, and in particular the National Hydropower Plan Study, which is currently underway. This provides a clear example of how the decision making process is tilted in favour of dam-building, and the ways in which the political infrastructure works to ensure that dams continue to get built. Vietnam has a number of dams already, the largest being the 1,920 MW Hoa Binh dam, completed in 1994 and which led to the eviction of 58,000 people from their homes and land. The 720 MW Yali Falls dam on the Se San river in the Central Highlands of Vietnam is now almost completed, and the 70 MW Song Hinh dam is also nearing completion. Another, the Son La dam is proposed at the end of the reservoir of the Hoa Binh dam. The reservoir behind this 3,600 MW dam (designed so that the flood would just reach the Chinese border over 200 kilometres upstream), would flood the homes of 130,000 people. In the south, the Ham Thuan and Da Mi dams are approaching completion (472 MW in total, on the La Nga River in Lam Dong province) funded by Japan’s OECF. Proposed dams include, the Huoi Quang (600 MW, Da River basin), Ban Mai (350 MW, Ca River), Dai Ninh (300 MW, Dong Nai River), Dong Nai 4 (200 MW) and Dong Nai 8 (140 MW). Construction started last year on the Can Don (60 MW) on the Song Be river. On the Se San river in the central highlands, the Se San 3 is currently at feasibility stage with Asian Development Bank backing, and according to Vietnam’s Institute of Energy three other dams are proposed for the Se San river : Pleikrong (120 MW), Upper Kontum (260 MW) and Se San 4 (366 MW). These dams have been studied on and off for the last 40 years or so, and it would appear that the Vietnamese government is selecting them one or two or three at a time and building them. 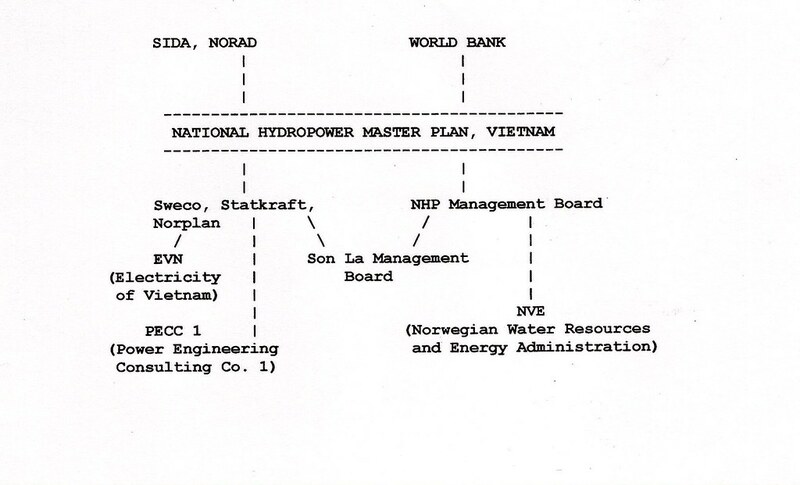 Yet, in April 1999 consultants started a two-year “National Hydropower Plan Study” for Vietnam. Why? What is the purpose of this study? To try to understand this it’s worthwhile to look at some of the actors behind study. The study is funded (to the tune of US$3.24 million) by NORAD and Sida, the Norwegian and Swedish overseas aid agencies. The consultants are SWECO International (Sweden), Statkraft Engineering (Norway) and Norplan AS (Norway) working together as a consortium. The various actors that have influenced the development of the National Hydropower Plan Study. Sida has been instrumental in recent years in promoting dams in Vietnam: it funded a masterplan for the Se San river, a small engineering/tunneling training project on the Yali Falls dam, the Song Hinh dam (Phu Yen province, 150 km from Nha Trang), and studies on the Son La dam. NORAD part funded the Theun Hinboun dam in Laos (which Statkraft and Norplan were also involved in), the Pangani and Kihansi dams in Tanzania (which Norplan was also involved in). SWECO International is owned by VBB Viak – the engineering firm that built many of Sweden’s dams. SWECO was established in 1887, and today the SWECO group (which consists of eight companies) employs 2,400 people. SWECO International was registered on the Stockholm stock market in 1961, and is the part of the SWECO group that works outside Sweden. It is a consulting company which plans, designs, supervises all stages of the development of dams, and other engineering projects. In 1994 SWECO did a feasibility study for the Son La dam. Together with Statkraft, SWECO did a review of the masterplan for the Se San river. In 1999 SWECO carried out a feasibility study of the Se San 3. So, there is little doubt as to whether any of these consultants are dam-builders. And even less doubt as to what they will recommend at the end of the study – dams, dams and more dams. The World Bank wields an enormous influence in Hanoi – influence gained not least because it chairs the donors’ group meetings which every year offer Vietnam around US$2 billion in “aid”. Since 1994, when the US-led embargo with Vietnam was finally lifted, Vietnam has become the second highest recipient of World Bank IDA loans in the world. So if the World Bank suggests a hydropower plan, pretty soon you can bet there will be one. While the World Bank was on the one hand suggesting a hydropower study, officials from the Bank stated that they would not consider funding the Son La dam until a hydropower study for the whole country had been carried out – thus giving the Vietnamese government a little encouragement to think seriously about carrying out the hydropower study. Now that the National Hydropower Plan Study is underway the Bank has stated that it will not fund any dam projects in Vietnam, in particular the Son La dam. In fact Bank officials have suddenly started to describe the Son La project as “not a good idea”. In Vietnam, says Bank official Nisha Agrawal, “we are not in the business of power production. . . . It’s an area we’ve gotten out of, basically”. Yet the World Bank published a report last year: “Fueling Vietnam’s Development – New Challenges for the Energy Sector” which states that “The Son La power plant appears promising”, at least from an economic perspective. So, the Bank might not fund dams directly, but it will certainly continue to promote hydropower behind the scenes. By November last year the consultants had produced a 1600 page “inception report”, a report that was not available to the public – at least until the consultants had received and incorporated comments from a range of institutions, including the World Bank. The institution in charge of running the National Hydropower Plan (NHP) Study is a management board consisting of people from the Son La Management Board. NVE (Norwegian Water Resources and Energy Administration) has provided an advisor to head the NHP board. The institution responsible for the day-to-day running of the study in Vietnam is the Management Board responsible for promoting the largest dam in Southeast Asia, the 3,600 MW Son La dam. Just to remind you, the Son La project, if built as currently proposed, would flood the homes and land of 130,000 people. Perhaps not surprisingly the consultants for the NHP study selected the Son La dam as one of the projects for further study in phase 2 of the study. The NHP study is supposed to look at the future options for the Vietnamese government in the hydropower sector. It will not look into other options for power generation, or attempt to compare hydropower with gas, or coal, or nuclear, or solar, or wind power. Nor will it look at demand side management. So what is the study for? Hydropower dams are going ahead in Vietnam regardless of the NHP study. We need to turn to what the consultants themselves have to say to begin to understand the reasons for the study. According to the consultants, one of the purposes of the study is to provide the “rigor and cross-sectoral approach that in recent years are required by international funding agencies.” One of the justifications for including “stakeholders” is that “the involvement of stakeholders at an early stage will also most probably facilitate less complicated financing of concerned projects.” In other words, stakeholders are to be included not because “project affected people” have a right to know that they are to be kicked out of their homes to make way for a dam, but because it will make funding easier. As a result of carrying out the NHP study, the consultants will get to know the institutions and the people within Vietnam who are responsible for the decisions behind dam-building. The consultants will thus be in a good position to lobby for future work in Vietnam. As part of the NHP study, the consultants will recommend dams that should be the subjects of further study, and the consultants will no doubt then attempt to win the contracts to do the further studies themselves. There is a clear conflict of interest here. The more dams the consultants recommend for further study, the more potential future work there is for dam-building consultants, such as themselves. If, on the other hand, the consultants were to recommend that no more dams be built in Vietnam, then they would have no future work in Vietnam. So far, after eight months work, the consultants have named 16 dams for further study, on four rivers, the Lo, the Da, the Se San and the Dong Nai. The National Hydropower Plan study for Vietnam will make no attempt to look at problems associated with existing dams in Vietnam, or anywhere else in the world. Several of the presentations we have heard at this meeting indicate the importance of doing precisely that. Will the WCD look at the political infrastructure behind such projects as the NHP study for Vietnam? Will the WCD address the issues surrounding the conflict of interests of employing dam-builders to advise on whether dams should go ahead? Why (and through what process) was Vietnam chosen for the venue for the Southeast Asian hearing of the commission?